The Zenith 1500 single pallet block making machine can produce various hollow blocks, paver bricks, curbstone, solid blocks and other standard concrete blocks, as well as many non-standard special products, landscape products and so on, meeting the demands of customers all over the world. 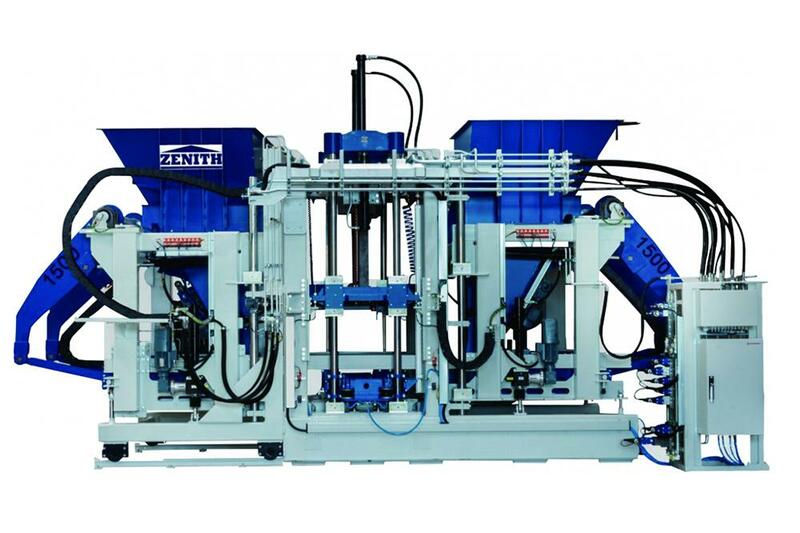 Zenith 1500 single pallet block making machine is top class intelligent production equipment newly researched and developed by Zenith. 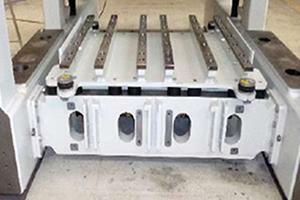 This block making device breaks free from traditional design by using a large number of high quality screw connectors, including the beam and side frame parts of the vibration table and motor designed with screw connectors. This reduces the amount of maintenance necessary for the equipment and minimizes the fault rate. 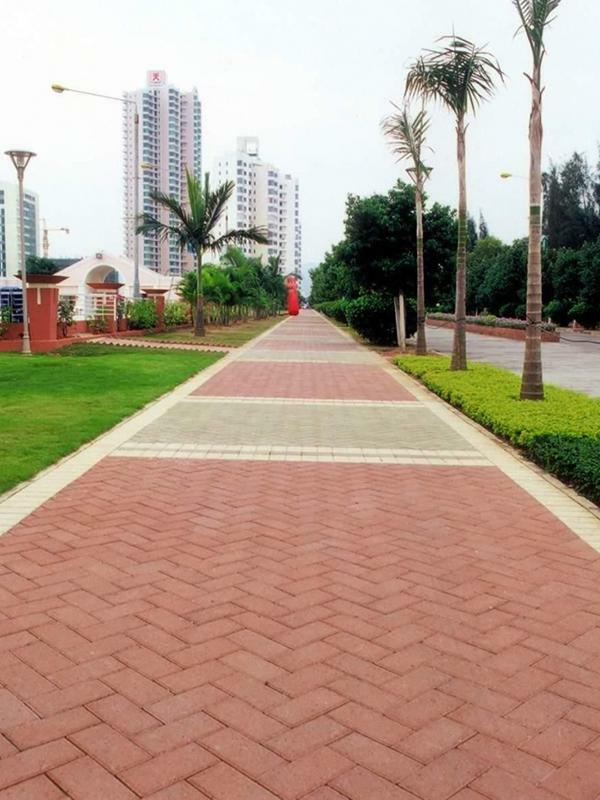 It easily satisfies the different production conditions of customers and significantly shortens the changing time of quick-wear parts. Zenith 1500 block making equipment is also equipped with an intelligent system, such as the latest control and automatic diagnosis system, servo vibration system and so on, to provide full support for operators. This equipment also has a variety of convenient and practical programs to control the extended devices or equipment like automatic and fast mould changing system, various colored materials batching equipment, tamper head cleaning device, etc., which can improve the production efficiency and product quality. 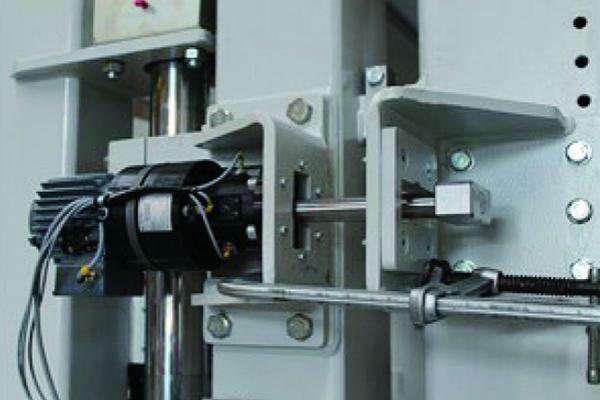 The mould frame and tamper head mounted on the synchronous guiding shaft of Ø 100 mm. 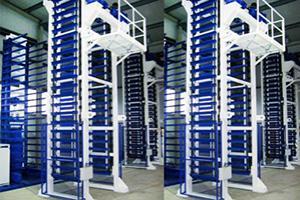 Four lifting spindles for lifting base materials and pigments feeding devices. 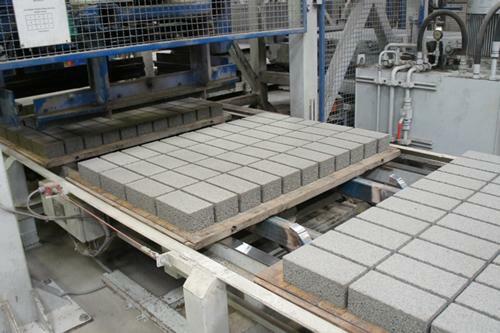 The board infeed pusher adopts pitch type trackway, driven by hydraulic pressure to convey the pallet to block machine. This system is controlled by hydraulic proportional valve and electronic limit switch. 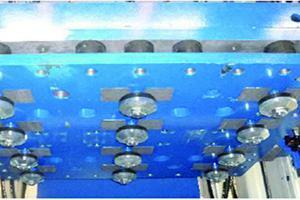 The mould frame features a strong welded structure without tensioning stress. 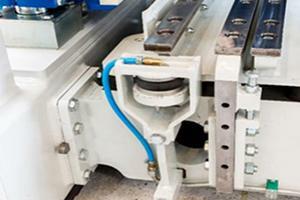 The side of the mould frame is fixed with highly wear-resistant plastic parts through the bolts. And the mould is fixed on the mould base with not bolts, but by air gas. The pressure of the air bag can be adjusted continuously to achieve short vibration time and longer service life of the mould frame. 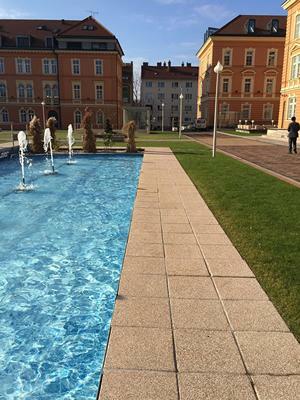 This device helps to improve the surface quality of concrete products and demould. 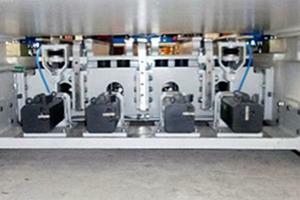 It consists of two vibrators that are installed on the tamper head frame. And the exciting force of these two vibrators can be adjusted respectively to adapt to the demands of different products. The laser level probe is used to detect the material level inside the hopper. The base material feedbox is mounted on the frame of the main machine. 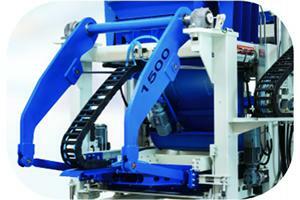 The feedbox is of hydraulic synchronous drive. The surface of the feedbox is made of high strength wear-resistant materials. The vibration table adopts welded structure, and it is equipped with rubber buffer and airbag of adjustable air pressure to reduce the impact of vibration on machinery. 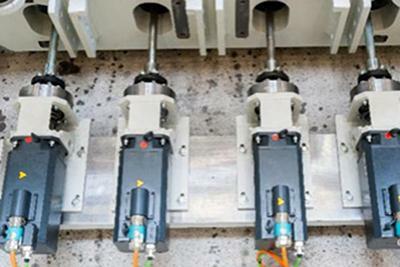 Four motor shafts with flexible couplings. Four Siemens servo frequency conversion motors (4×5.8kW) with a maximum peak of vibration reaching 200kN. 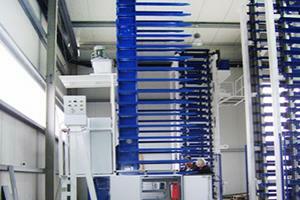 All the mainframe of the block making equipment are installed with pneumatic system module. The air compressor is prepared by customers. During demoulding process, the built-in tamper head locking bar can directly lock the tamper head to make it off the mould frame. Meanwhile, the tamper head can maintain mechanical synchronous movement. It contains hydraulic valve, check valve and other hydraulic components and pipelines for the hydraulic operating of the main machine. The proportional valve with integrated circuit is used to control the movement of feedbox, mould frame, tamper head and board feeder. Rotary pulse emitter and so on. The independant pneumatic scraper is separately mounted on the front and back of the feedbox. The movement of the feedbox is controlled by hydraulic proportional valve. And the agitator moves back and forth horizontally for feeding material. 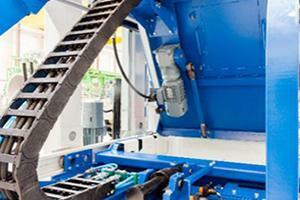 The hopper partition is controlled by hydraulic pressure. 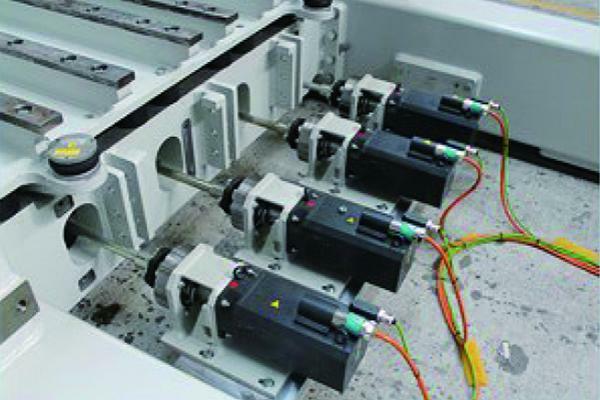 Servo vibration system: this machine equips with the newly developed servo vibration system which has dense and highly excited vibration force to ensure fast and efficient production. 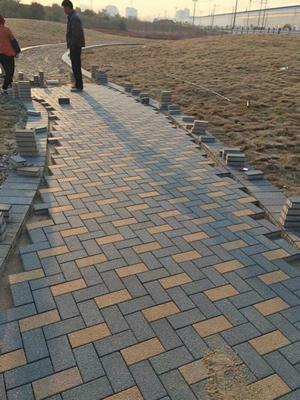 It has outstanding performance especially for massive and high quality products need to be manufactured by pre-vibration and transient vibration. 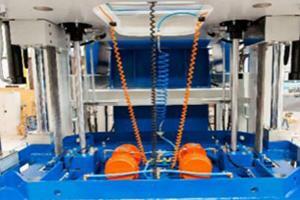 Hanging feeding technology: the hanging design of feedbox achieves optimized feeding. And the feedbox of the pigments and base material are separately mounted on the frame of feeding device, which can be replaced quickly. 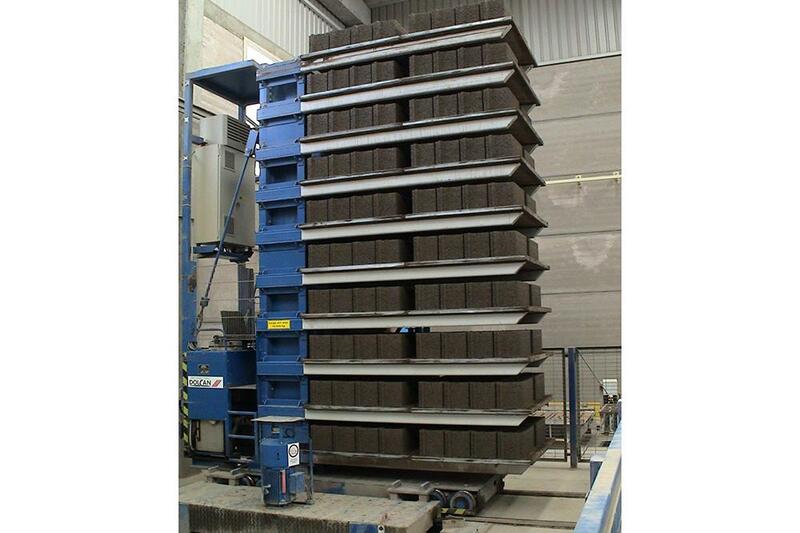 Scraper frame can be adjusted as required, and the operator can continuously monitor the feeding condition inside feedbox so as to adjust the use of the next batch of material. 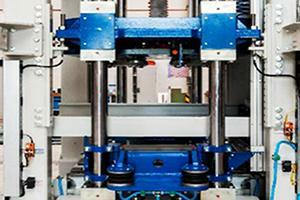 Fast mould changing: this block making machine adopts new type automatic pigments locking machine. 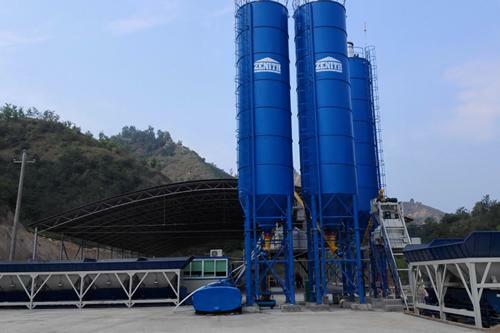 Driven by motor, the pigments device can automatically connect with the main machine quickly, precisely and safely to realize fast mould replacing and reduce the time and cost of maintenance. PLC intelligent interactive system: the latest automatic diagnosis function helps the operator choose the best solution, minimizing the production failure time. With the latest database, all the information can be recorded, stored and analyzed. Automatic diagnosis system: through ProdiNet and Ethernet technology, all the controllable movement adopt absolute value coding technology. So there is no need taking time to calibrate when power cut occurs. 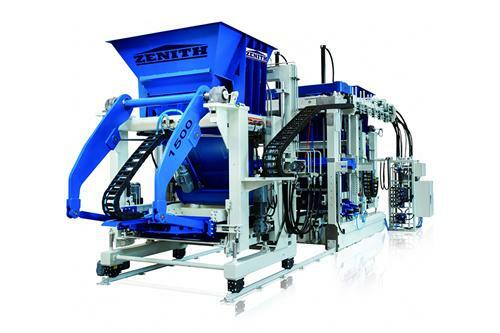 In addition, this equipment is equipped with remote control, so sales engineers of Zenith can provide technical support internationally to equipment connected through the Cloud Service Platform. 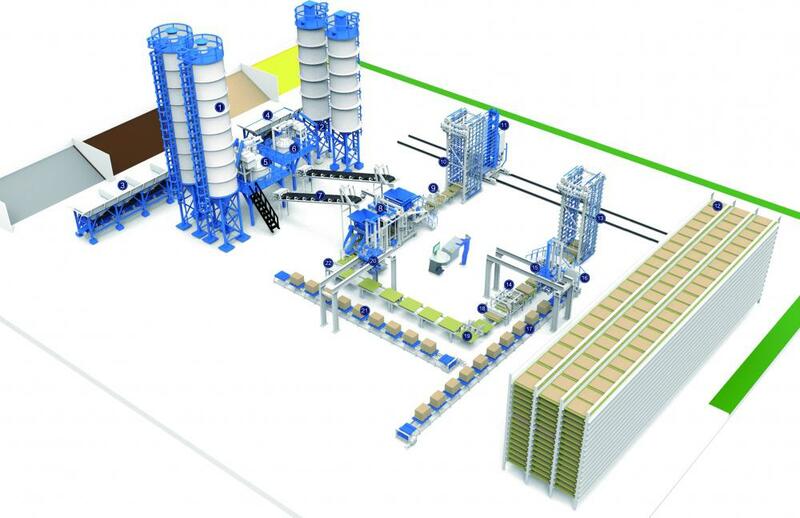 Extensible performance: with extensible performance, this equipment is equipped with various convenient and practical programs to control the extended device or equipment, such as automatically rapid mould changing system, various colored batching equipment and tamper head cleaning devices.